In the Schinkel Pavillon’s basement, as if in a cellar, a hiding place, a hackers’ hang-out—in fact, in the days of the German Democratic Republic, the place was a restaurant called the Schinkel Klause, whose decorations can still be seen on the walls—, there is currently an exhibition called “Proof of Work”, a title referring to the system of validation making it possible to encrypt transactions taking place in a blockchain, and produce new blocks, because it just so happens that the works brought together for this show question the way blockchains work in a decentralized way, as an artistic model and a creative starting point. What is more, the idea has been applied since the organization of the exhibition, because the curatorship is a collective one, brainchild of the New Zealand artist Simon Denny, who invited other curators and artists who, in their turn, invited organizations and artists, as is explained in a diagram at the entrance. So the exhibition itself is the result of a sort of curatorial blockchain, lending tangibility to what artistic activity and, more broadly, all work activity undertaken by collectives, can borrow from operating methods emerging from the Internet. And, overall, in addition to the fascination exercised by the subject and its extremely contemporary character, the works selected are very persuasive. Whether we are acquainted with or whether we are discovering the mining of cryptocurrencies and the blockchains, and whether we understand it or not, the exhibition gives material form in different ways, all of them interesting, to some of its aspects, while at the same time introducing a line of thinking about the links between art and its day and age. Distributed Gallery, Chaos Machine, 2018 (détail). 192 x 52 x 52 cm. Courtesy Distributed Gallery. Photo : Hans-Georg Gaul. 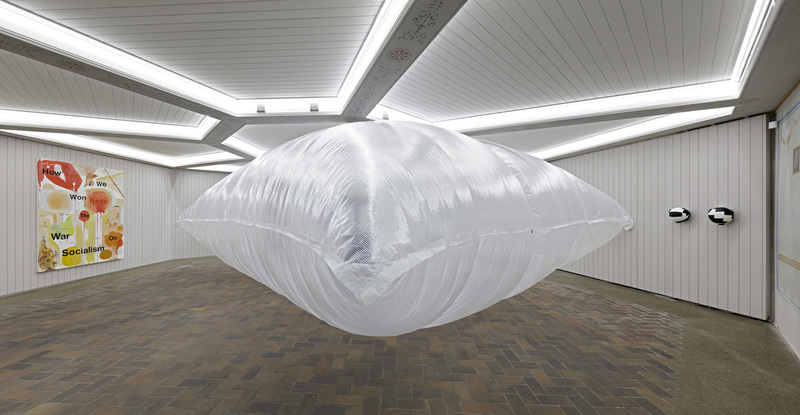 For example, in the central area of the Schinkel Klause, visitors come upon the huge inflatable and penetrable bubble created by FOAM, a decentralized architectural agency, blown up by computer fans producing Ether, one of the major cryptocurrencies, after Bitcoin. Once in the bubble, you consequently find yourself physically at the centre of a usually very abstract system in which, here, the attention is focused on the energy consumed by the computers as they mine. Another work, which we come across inside the bubble, makes a connected phenomenon perceptible, namely the conversion of official currencies into cryptocurrency. 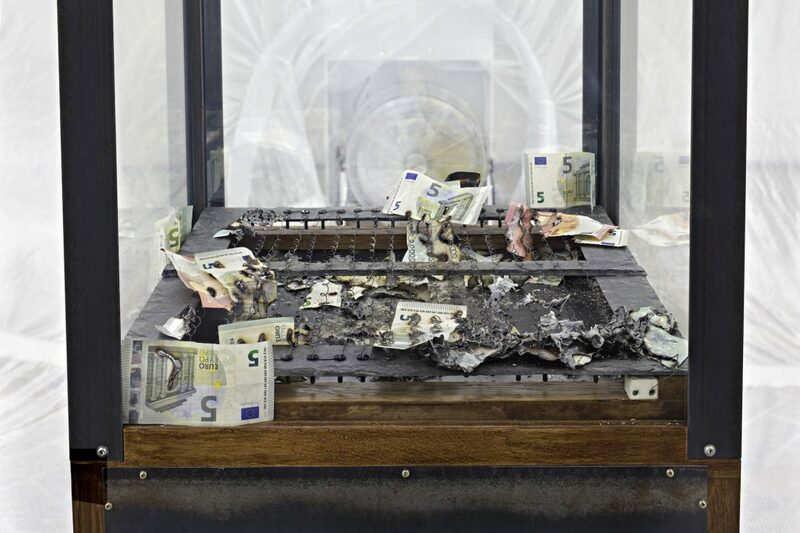 Looking like a prize vending machine at a fairground, the Chaos Machine produced by the Distributed Gallery collective starts working when you insert a real banknote into it. While festive music starts to play, the note that has dropped into the machine burns on a very hot resistor, an operation that is followed by the printing of a credit receipt in chaos coin, a cryptocurrency invented for the occasion. The transaction has taken place before our very eyes. In this way, the two works—the bubble inflated by computer fans and the chaos coin ATM—enable us to see the immaterial but thoroughly real flows and exchanges, which, if anything, are becoming increasingly decisive in the present-day world. And this is one of the major merits of this show, that it has managed to flush out works which reflect these realities in a concrete way. But other artists respond in a different and more performative way to the issue raised by the show. In the restaurant’s old tiled kitchens, three works by Harm Van den Dorpel, a Berlin-based Dutch artist—a generative, on-screen piece and two prints on Plexiglas created by the same process—, incarnate the result of exchange protocols applied to visual art. The images are in fact produced by the circulation and development of coloured motifs between two basic entities, based on a procedure devised by the artist, with abstract images as the result—we might even call them extremely poetic pictures, worthy of Paul Klee compositions. 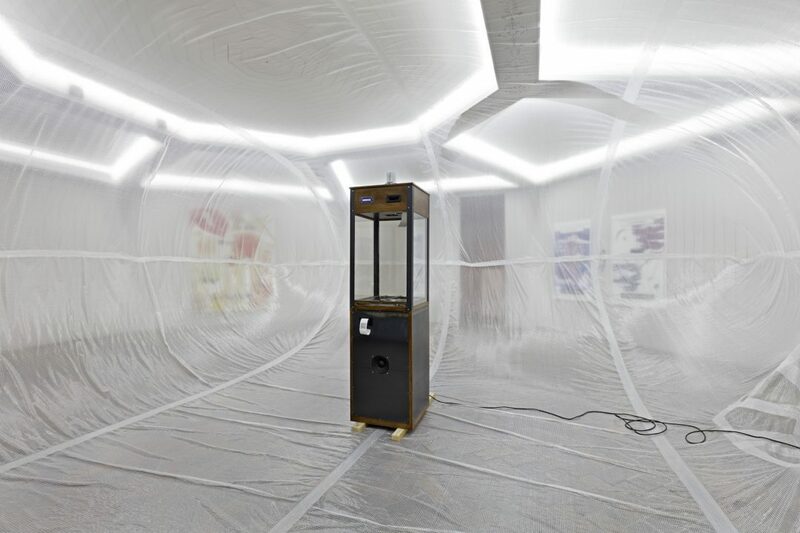 A little further on, rubbing shoulders with a second inflatable bubble by FOAM, a painting on wood by the Swedish artist Jonas Lund acts as a publicity poster for his own cryptocurrency, the Jonas Lund Token, or JLT. This tangible and explicit board refers to a conceptual dimension, to a fragmentation of the decision-making process at work in Lund’s art praxis into units belonging to the JLT holders (the artist’s collectors/shareholders), whose value is index-linked to the success of his career. Works and cryptocurrency are here the two sides of one and the same project. The exhibition also includes paintings which echo blockchains, sculptures and installations, and one or two drawings, as well as other textual pieces, a delightful diversity in a context where one might have feared a certain formal aridity. Not a bit. The works chosen are noteworthy, both visually and conceptually. Accompanied by a booklet which explains the terms used for cryptocurrencies, and introduces the specific approach of each artist and collective, the exhibition represents a fine example of art’s ability to make use of the most complex of phenomena. Curated by Simon Denny in dialogue with Distributed Gallery, Harm van den Dorpel, Sarah Hamerman & Sam Hart, Kei Kreutler, Aude Launay, and Anna-Lisa Scherfose. With: CryptoKitties, Aria Dean, Distributed Gallery, Harm van den Dorpel, FOAM (Ryan John King, Ekaterina Zavyalova, Nick Axel and Kristoffer Josefsson), Sara Hamerman & Sam Hart, Decentralized Autonomous Kunstverein (Nick Koppenhagen & Wesley Simon) Kei Kreutler, left gallery (Harm van den Dorpel and Paloma Rodríguez Carrington), Wayne Lloyd, Mark Lombardi, Jonas Lund, Rob Myers, Hayal Pozanti, Billy Rennekamp, Jason Rohrer, Miljohn Ruperto and Ulrik Heltoft, 0xΩ (Avery Singer and Matt Liston), terra0 (Paul Seidler, Paul Kolling and Max Hampshire in collaboration with Georgia Hansford, Louis Center and Gregor Finger). Image on top: « Proof of Work », Schinkel Pavillon, 2018. Left : Wayne Lloyd, How We Won the War on Socialism, 2000; center : FOAM, Tropical Mining Station, 2017; inside : Distributed Gallery, Chaos Machine, 2018; right : Billy Rennekamp, Leather Spheres, 2013. Photo : Hans-Georg Gaul.